The other part of my question, the one deemed unsuitable by the Chief Solicitor, was about another part of the Mayor's response to my question at last full Council. The Mayor revealed that the budget for the Tall Ships race had almost tripled from the £800,000 figure initially mentioned. However, the Mayor did not give a breakdown (as requested in my question) of the major cost areas that made up the expected spending. I therefore again asked for a list of the cost centres identified for the Tall Ships Event and the estimated total amounts for each cost centre from the start of the project until the last bill is paid after the event. 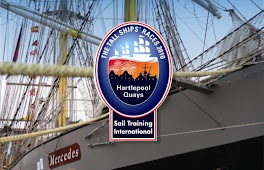 "I am submitting this question with over three weeks notice in the hope that you will be able to circulate the figures requested in writing to all councillors with a projected profit / loss account and balance sheet for the Tall ships race in advance of the next full council meeting. This will enable you to use your verbal answer time in the meeting to explain in detail the figures and allow all Councillors to study the figures before the Council Meeting which will therefore hopefully allow more informed debate during the meeting." Lets face it, the last thing that they really want is Councilors in possession of some facts and figures and actually having a well informed debate. Why break the traditions of many years!